Add your poetry books here. There are 500 million people worldwide. One in every three are living with a dragon unknowingly. The dragon I speak of is a silent killer. No one knows where it comes from or when it became attached to them. And no one wants to talk about it because those without a dragon misunderstand. The dragon invades the liver and is the number one cause for liver transplants in the world. 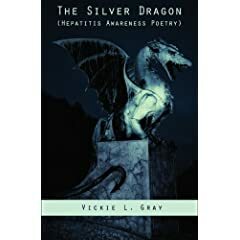 My book “The Silver Dragon, Hepatitis Awareness Poetry”, is a collection of short stories in rhyme, if you will. A collection of poems about the hepatitis dragon and how it affects the ones it inhabits. A creation out of two minds, a duet of perspectives…enjoy the different tastes, angles, and writings. Words are the keys to our quills; words mean a lot to us and invoke images, even beyond the pen. Let this mosaic of opinions, experiences, perspectives, and themes penetrate and resonate your body, soul, spirit, and mind. Two women, separated in space, time, life experience, and more…Where thoughts converge and diverge, over the boundaries of a lifetime past and a lifetime ahead. Where visions and ideas are expressed, so deviant for this era and yet so typical in every aspect. Let the different colours of this mosaic enchant you… to find more than what normally can be said. Beyond what has been said before, these two authors do not cringe to speak their mind on love, jealousy, death, relationships, and the darkness life can bring. Let them be a voice to you, narrating the spirit of the twenty-first century…Where minds evolve but taboos remain firmly in place. 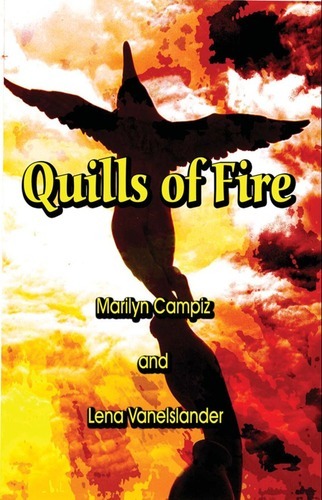 Let the colours marvel your mind and sway you beyond society’s norms and values: we present you Quills of Fire. Purchasing: Amazon, PublishAmerica, by contacting author. How can I display my two published poetry books on this page?